The online encyclopaedia Wikipedia is on the cusp of launching a major revamp to how people contribute to some pages. The site will require that revisions to pages about living people and some organisations be approved by an editor. This would be a radical shift for the site, which ostensibly allows anyone to make changes to almost any entry. The two-month trial, which has proved controversial with some contributors, will start in the next "couple of weeks", according to a spokesperson. "I'm sure it will spark some controversy," Mike Peel of Wikimedia UK, a subsidiary of the organisation which operates Wikipedia, told BBC News. However, he said, the trial had been approved in an an online poll, with 80% of 259 users in favour of the trial. "The decision to run this trial was made by the users of the English Wikipedia, rather than being imposed." 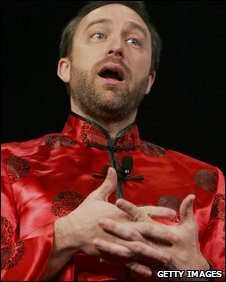 The proposal was first outlined by Wikipedia founder Jimmy Wales in January this year. It was met by a storm of protests from Wikipedia users who claimed the system had been poorly thought out or would create extra work. The two-month trial will test a system of "flagged revisions" on the English-language Wikipedia site. This would mean any changes made by a new or unknown user would have to be approved by one of the site's editors before the changes were published. Whilst the changes are being mulled over, readers will be directed to earlier versions of the article. Wikimedia said the system was "essentially a buffer, to reduce the visibility and impact of vandalism on these articles". There have been several high-profile edits to pages that have given false or misleading information about a person. For example, in January this year the page of US Senator Robert Byrd falsely reported that he had died. If a page has a number of controversial edits or is repeatedly vandalised, editors can lock a page, so that it cannot be edited by everyone. For example, following initial reports of the death of Michael Jackson, editors had to lock down two pages to stop speculation about what had caused his death. "For these articles, flagged protection will actually make them more open," said Mr Peel. The decision had been made to focus on the pages of living people, he said, because they were the "most high-profile pages with the highest probability of causing harm". "[The trial] may also be extended to organisations which are currently operating," he added. The system has already been in operation on the German version of Wikipedia for more than a year. The changes to the English language site - which now has more than 3m pages - will be rolled out in the coming weeks, said Mr Peel. The changes will be discussed in Buenos Aires this week at the annual Wikimania conference. Its been over a year since the announcement but still this feature has not been lauched . Which is good. . . . . well it really doesn't matter, it's pretty much already moderated to make sure it's as liberal and politically correct and incorrect as possible. Especially about certain subjects. Oh that's great and use for it control.